Equine Assisted Therapy and Learning - JohnMel Stables Inc.
No truer words have been spoken and those of us who have the priviledge of being around horses daily say it saves us money on therapy. We are excited to provide this opportunity to others. Why Equine Assisted Therapy and Learning? Equine Assisted Therapy and Learning has proven to help many people navigate life’s challenges. These may include mental health issues such as anxiety, depression, addictions and post traumatic stress disorders. Or it could be working through a life challenge that has presented itself. Sometimes talk therapy isn’t working so the use of equine assisted therapy provides an alternative or an additional method of assisting people work through various challenges. The EAGALA model is a team approach, client led and solution focused. No horse experience is necessary and a client doesn’t need to even touch horses if they don’t wish to do so. Sometimes just being around the horses offers the calm and the space people require. It provides an opportunity to work out some of the issues that the person is struggling with as horses are intuitive, very social and mirror back our inner selves. This type of reflection offered by the horses is what makes the approach so powerful. Often people will use the horses to tell their story and it is less intimidating than talking about oneself. 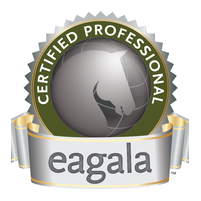 John and Melanie Ryan are Equine Assisted Growth and Learning Association (EAGALA) certified equine specialists. Working with a mental health professional and the horses, we provide equine assisted therapy. Individual, couple, family and group sessions are available. We also provide corporate leadership and team building using horses. For more information on EAGALA, visit the EAGALA Canada website. Learn more about the science behind equine-assisted therapy and what benefits riders take from the experience. Super-sensitive animals may pick up on hidden emotional trauma. © 2019 JohnMel Stables Inc.